for all keyboard instruments and all levels of skill. Flash Cards for Musical Instruction. Peter Krauss, keyboard instructor based in the Hudson Valley of New York, has been teaching piano and organ to students of all skill levels since 1990. His musical training includes undergraduate studies at Oberlin Conservatory and a Masters Degree in Music from the Juilliard School of Music. Peter Krauss' teachers include such luminaries as Bronson Ragan, Minka Routcheva and Vernon deTar. 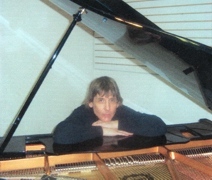 A versatile composer and performer, Peter has written and performed a great variety of music. His albums include Dream Collage - a collection of original new age meditative music, and an album of classical music recorded on the exquisite period pipe organ located at the Chapel of Our Lady Restoration. Perhaps most importantly, Peter Krauss is the inventor of a truly innovative sightreading system, a learning tool which aids students of every level of ability. He has created a unique set of musical flashcards which he calls "Mozart's Flashcards". Peter uses these cards extensively with his own piano students, as they are an effective and flexible music reading tool. Other teachers have also found them valuable for training their students to read music. He is now marketing these remarkable music flashcards, so that others can share in the joy of accelerated learning.